In what was seen as the first step towards the separation of church and state in Greece, PM Alexis Tsipras and the head of the Autocephalous Orthodox Church of Greece, Archbishop Ieronymos, made an unexpected joint announcement on Tuesday, in which they disclosed a “historic” agreement to revise financial relations between the government and the church. According to this agreement, the Greek state and the Church will create a joint fund to manage the church’s assets, holdings and investments, which will also cover for the salary of the 10,000 clergymen currently serving the Church, who are now part of the civil servant payroll. It is the first time in three decades that the thorny issue of the Church’s assets is discussed in Greece, and the first time when a compromise is reached. In the statement, the Greek government acknowledges that a portion of the Church’s assets were appropriated in 1939 at below market values and that, in return, the Greek state has undertaken the obligation to cover for the clergy’s wages. 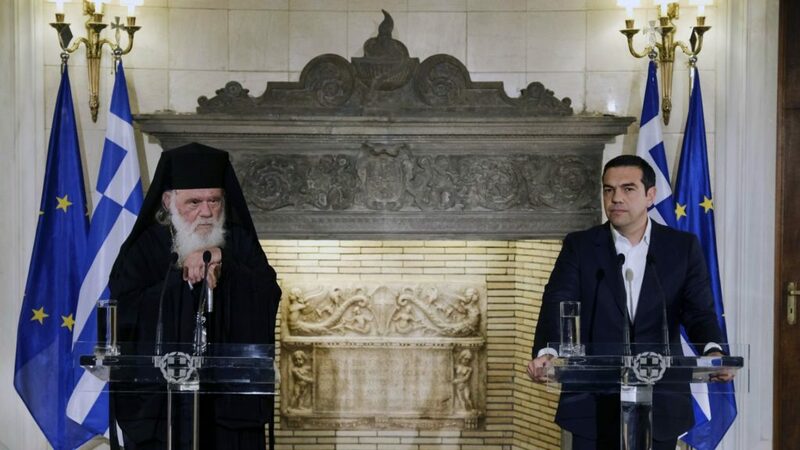 “After 79 years the issue of the Church’s estate is resolved … the state recognises that it assumed the clergy’s payroll in exchange for the (Church) estates that it acquired (in 1939),” the Greek PM said after his meeting with the Archbishop at the Maximos Mansion. “We thank you because you were a factor of change at this historic moment, in this great event for which the Church feels not that it is becoming wealthier, it’s not interested in this, but that it becomes more functional in fulfilling its visions,” Archbishop of Athens and All Greece Ieronymos commented. According to the agreement, the new joint fund will be managed by a five-member board of directors, two of which will be appointed by the government and two by the Church, the fifth one being decided by vote. The Greek state will contribute an annual sum to the fund, which will be equal to the current cost of clergy payroll, taking into account future inflation rates. However, if the Church decides to hire more priests than the 10,000 currently employed, the government will not cover that cost. Critics of this agreement stated that it amounts to nothing more than “accounting semantics,” since the state will continue paying for the clergymen’s salaries, albeit in form of an annual subsidy. Others see the decision to take clergymen off the state’s payroll as the first step towards the separation of church and state, in light of the current process of constitutional revision, expected to be set into motion this month. The Tsipras government’s constitutional revision proposal to declare the state’s “neutrality” vis-a-vis religion, was accompanied by a pledge by Tsipras that the revised language in the constitutional article, if ratified by Parliament, will not in any way clash with the “age-old traditions of our people”. Government spokesperson Dimitris Tzanakopoulos said that the state is expected to save roughly 200 million euros from this change, which “gives the government the opportunity to fill [10,000 civil servant] positions in the coming years,” promising hirings of teachers and doctors in place of clergymen, starting from 2020. The government claims that this cost will be covered by the fiscal surplus in the current and future budgets. For government critics, the pledge to hire more civil servants is nothing more than an election promise, given that Greece will take to the polls in 2019. Apart from the Opposition the agreement between Tsipras and Ieronymos was also met with criticism from parts of the church, with clergymen reportedly preparing to protest against changing the status quo. Ieronymos added that after the Holy Synod – comprising the Church’s Metropolitans (bishops) – a “major effort” will have to be exerted to persuade clergymen that the proposed agreement is positive.